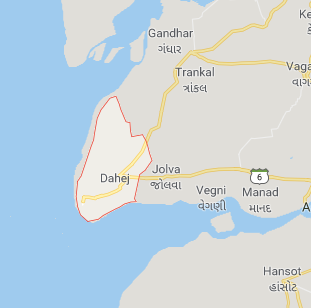 The Port of Dahej is located in the Gulf of Cambay, at the junction of Guljaria and Ban Creek. It is a natural deep water port accommodating vessels of draft up to 25m. It is about 45 kilometers from Bharuch, which is now being connected to the Port of Dahej by a broad gauge rail siding with an initial capacity of 25-30 rakes a day. The nearest airports are at Ahmedabad, Surat and Baroda. A deep draft multi cargo berthing facility is being proposed with a 3.5 km waterfront, to develop the port according to the directions of the Gujarat Maritime Board. In addition to this there are four other port facilities at Dahej, owned by Petronet LNG Limited (including a bulk terminal sub-concessioned to Adani), GCPTCL, Birla Copper and Reliance Industries.